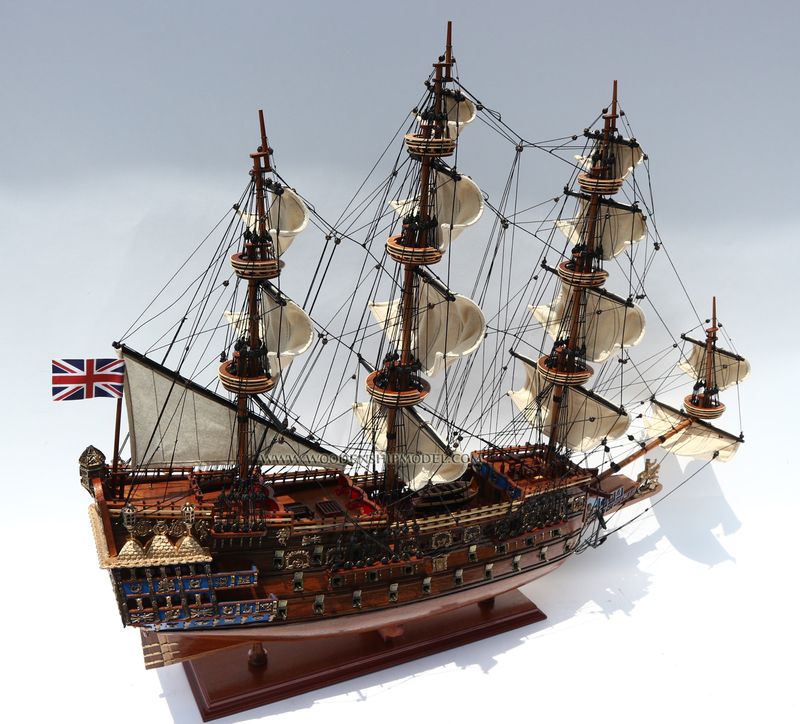 Sovereign of the Seas was a 17th-century warship of the English Navy. 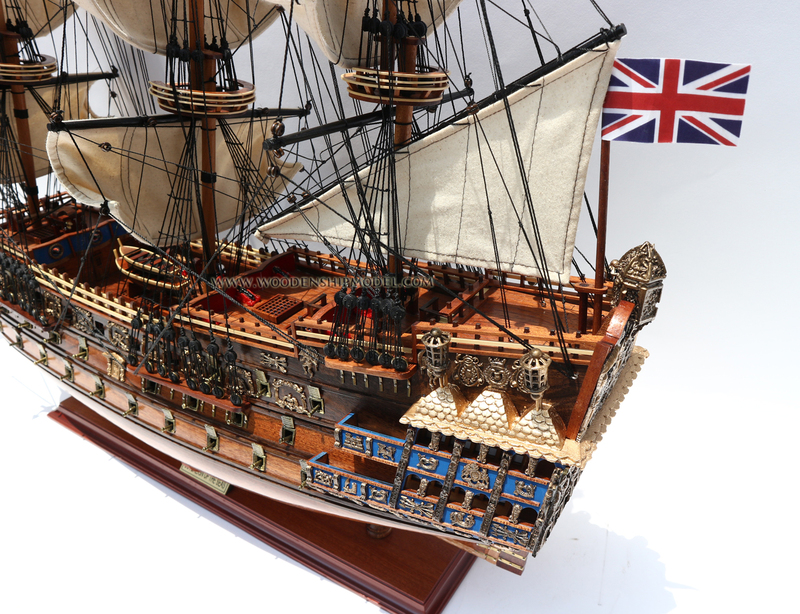 She was ordered as a 90-gun first-rate ship of the line of the English Royal Navy, but at launch was armed with 102 bronze guns at the insistence of the king. It was later renamed Sovereign, and then Royal Sovereign.The ship was launched on 13 October 1637 and served from 1638 until 1697, when a fire burnt the ship to the waterline at Chatham. Sovereign of the Seas was ordered in August 1634 on the personal initiative of Charles I of England, who desired a giant Great Ship to be built. The decision provoked much opposition from the Brethren of Trinity House, who pointed out that "There is no port in the Kingdome that can harbour this shipp. The wild sea must bee her port, her anchors and cables her safety; if either fayle, the shipp must perish, the King lose his jewel, four or five hundred man must die, and perhaps some great and noble peer". But the King overcame the objections with the help of John Pennington and from May 1635 she was built by Peter Pett (later a Commissioner of the Navy), under the guidance of his father Phineas, the king's master shipwright, and was launched at Woolwich Dockyard on 13 October 1637. 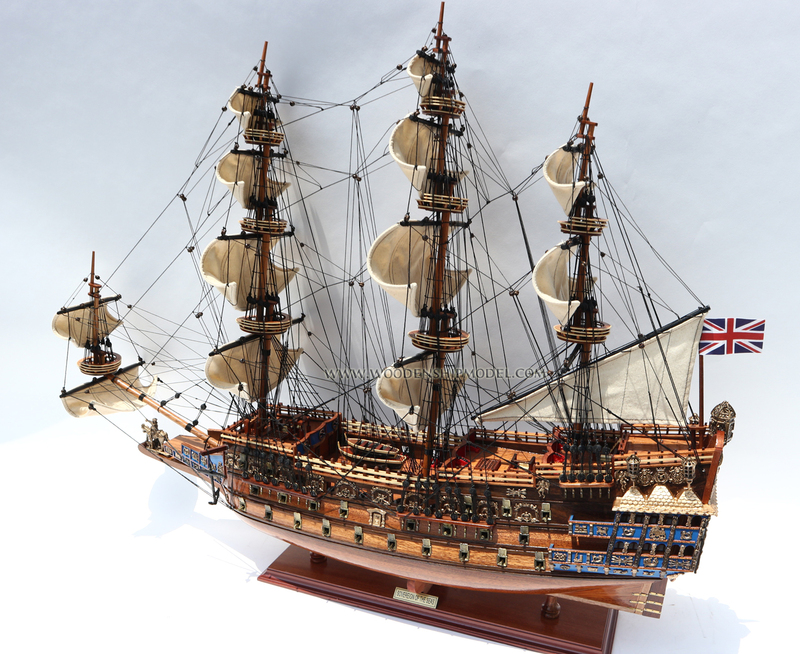 As the second three-decked first-rate (the first three-decker being the Prince Royal of 1610), she was the predecessor of Nelson's Victory, although the Revenge, built in 1577 by Mathew Baker, was the inspiration for her, providing the innovation of a single deck devoted entirely to broadside guns. 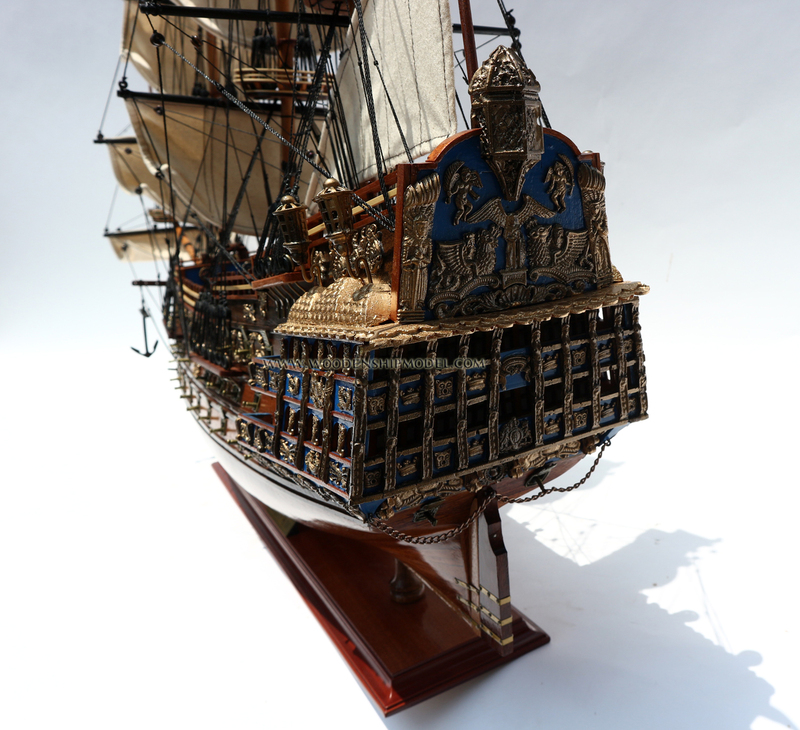 She was the most extravagantly decorated warship in the Royal Navy, completely adorned from stern to bow with gilded carvings against a black background, made by John Christmas and Mathias Christmas after a design by Anthony van Dyck. The money spent making her, £65,586 (equal to £10,783,075 today), helped to create the financial crisis for Charles I that contributed to the English Civil War. Charles had imposed a special tax, the 'Ship Money', to make possible such large naval expenditure. The gilding alone cost £6,691 (equal to £1,100,076 today), which in those days was the price of an average warship. She carried 102 bronze cannon (King Charles explicitly ordered such a high number) and was thereby at the time the most powerfully armed ship in the world. The cannon were made by John Browne. Sovereign of the Seas had 118 gun ports and only 102 guns. The shape of the bow meant that the foremost gun ports on the lower gun deck were blocked by the anchor cable. Consequently, the fore chase – the guns facing forward – occupied the next ports. There were two demi-cannon drakes – one port, one starboard – some 11.5 feet (3.5 m) long, weighing together five tons (5000 kg). They had a bore of 6.4 to 6.75 inches (16.3 to 17.1 centimetres) and fired a shot weighing 32 to 36 pounds (15 to 16 kilograms), using around ten pounds of gunpowder. In the third ports from the bow, there were two 11-foot (3.4 m) demi-cannon drakes weighing, together, 4.3 tons (4300 kg). Behind them were twenty cannon drakes, nine feet long, and weighing in all 45.7 tons (45700 kg). In the third port from the stern were two more 11-foot (3.4 m) demi-cannon drakes weighing, together, 4.3 tons (4300 kg). The last two ports on either side were occupied by the stern chase – four 10.5-foot (3.2 m) demi-cannon drakes weighing a total of 11.4 tons (11400 kg). The middle gun deck had heavy fortified culverins – that is, guns short for their bore – fore and aft. There were two 11.5-foot (3.5 m) pieces, weighing 4.8 tons (4800 kg), in the fore chase; four 11.5-foot (3.5 m) pieces, weighing 10.2 tons (10200 kg), in the stern chase. Immediately behind the fore chase were two demi-culverin drakes, eight to nine feet (2.4 to 2.7 m) long, weighing some 1.9 tons (1900 kg). Then came twenty-two 9.5-foot (2.9 m) culverin drakes weighing a total of 30.4 tons (30400 kg). On the upper gun deck there were two 10-foot (3.0 m) fortified demi-culverins in the fore chase and two in the stern chase, both pairs weighing 2.8 tons (2800 kg). Between them there were twenty-two demi-culverin drakes, eight to nine feet (2.4 to 2.7 m) long, weighing over 21 tons (21000 kg) in total. There were eight eight-to-nine-foot (2.4 to 2.7 m) demi-culverin drakes weighing 7.7 tons (7700 kg) in the forecastle; another six weighing 5.7 tons (5700 kg) on the half-deck. The quarter-deck carried two six-foot demi-culverin drake cutts – a cutt, again, being a shorter version of a gun – weighing 16 hundredweight (726 kg). Then there were another two six-foot culverin cutts, weighing 1.3 tons (1,179 kg), aft of the forecastle bulkhead. In all, Sovereign of the Seas carried 155.9 tons (141,430 kg) of guns – and that did not include the weight of the gun carriages. Altogether they cost £26,441 13s 6d including £3 per piece to have the Tudor rose, a crown and the motto: "Carolvs Edgari sceptrvm aqvarum" – "Charles has established Edgar’s sceptre of the waters" – engraved on them. The gun carriages, made by Matthew Banks, Master Carpenter for the Office of Ordinance, cost another £558 11s 8d. 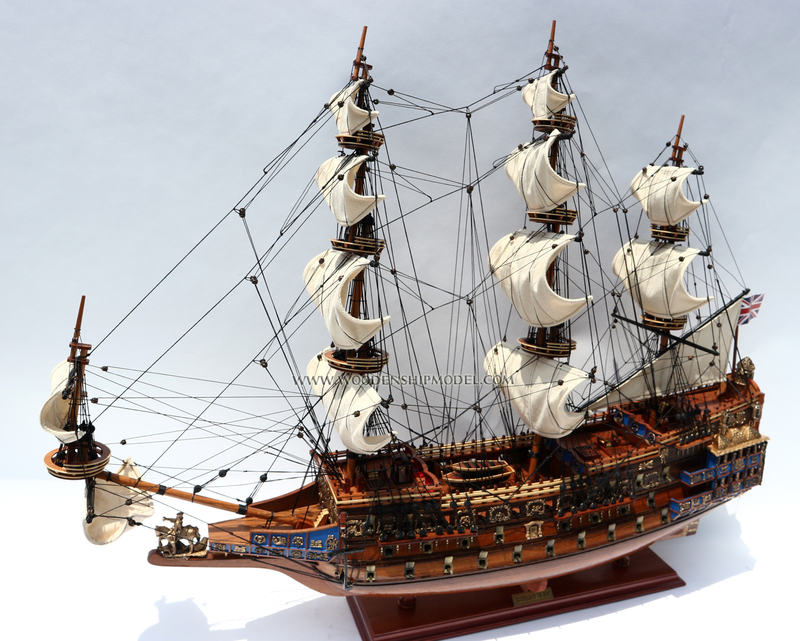 By 1642, her armament had been reduced to 90 guns. Until 1655, she was also exceptionally large for an English vessel; no other ships of Charles were larger than Prince Royal. Sovereign of the Seas was not so much built because of tactical considerations, but as a deliberate attempt to bolster the reputation of the English crown. Her name was, in itself, a political statement as Charles tried to revive the perceived ancient right of the English kings to be recognised as the 'lords of the seas.' English ships demanded that other ships strike their flags in salute, even in foreign ports. The Dutch legal thinker Hugo Grotius had argued for a mare liberum, a sea free to be used by all. Such a concept was mainly favourable to Dutch trade; in reaction, John Selden and William Monson published the book Mare Clausum ("the Closed Sea") in 1635, with special permission of Charles, which attempted to prove that King Edgar had already been recognised as Rex Marium, or "sovereign of the seas" - this book had been previously repressed by James I. The name of the ship explicitly referred to this dispute; King Edgar was the central theme of the transom carvings. Rear-Admiral Sir William Symonds noted that after the ship's launch she was "cut down" and made a safe and fast ship. In the time of the Commonwealth of England all ships named after royalty were renamed; it was first decided to change the name of the ship into Commonwealth, but in 1650 it became a simple Sovereign. 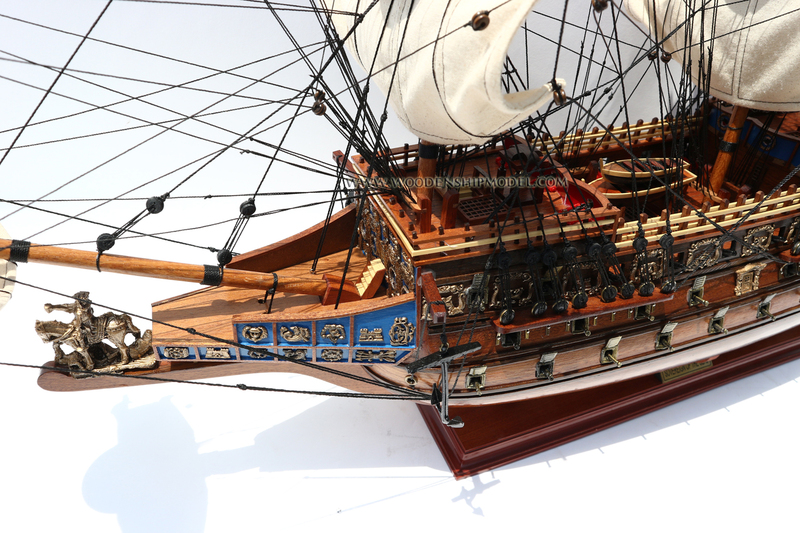 In 1651 she was again made more manoeuvrable by reducing upperworks after which she was described as "a delicate frigate (I think the whole world hath not her like)". 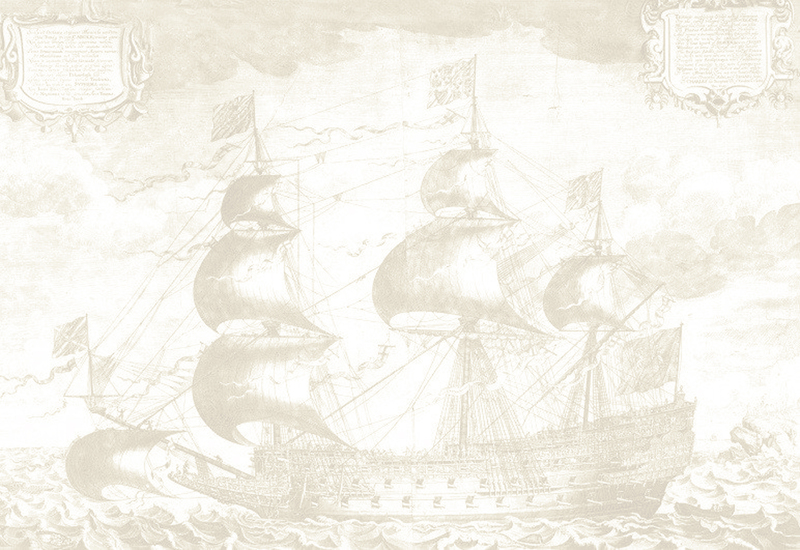 She served throughout the wars of the Commonwealth and became the flagship of General at Sea Robert Blake. She was involved in all of the great English naval conflicts fought against the United Provinces and France and was referred to as 'The Golden Devil' (den Gulden Duvel) by the Dutch. When, during the First Anglo-Dutch War, on 21 October 1652 the States General of the Netherlands in a secret session determined the reward money for the crews of fireships that succeeded in destroying an enemy vessel, Sovereign was singled out: an extra prize of 3000 guilders was promised 'in case they should ruin the ship named the Sovereign'. The ship had not seen action during the Civil War, remaining laid up. 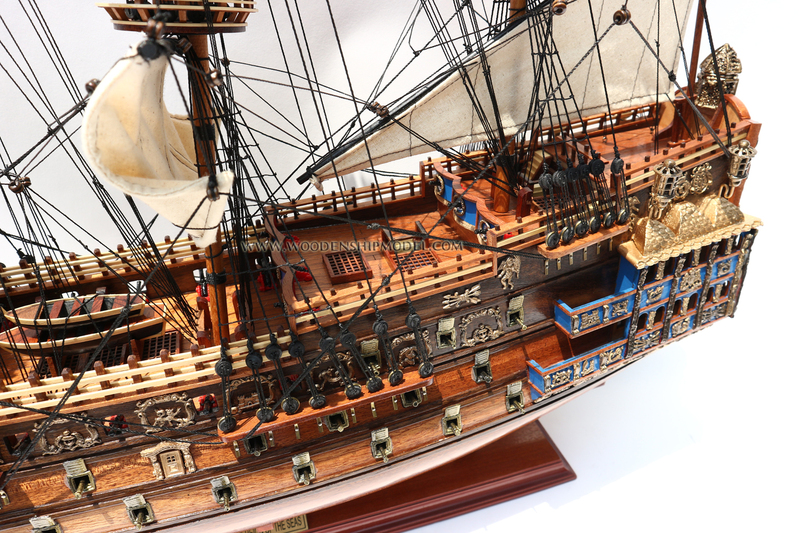 After being refitted in 1651, she had her first fight in the Battle of the Kentish Knock, armed with 106 guns. In this battle she ran aground on the Kentish Knock itself. 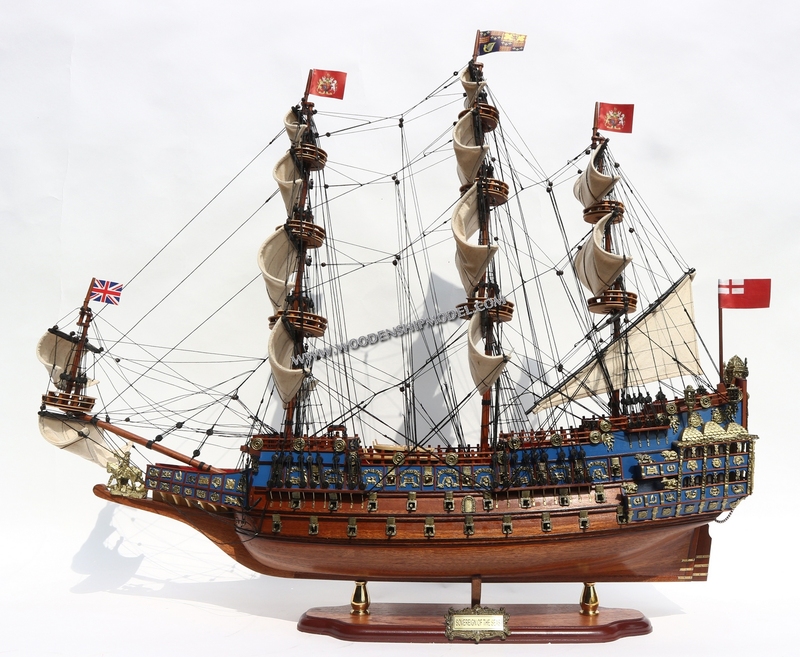 Although repeatedly occupied by the Dutch in the fiercest of engagements Sovereign was retaken every time and remained in service for nearly sixty years as the best ship in the English fleet. 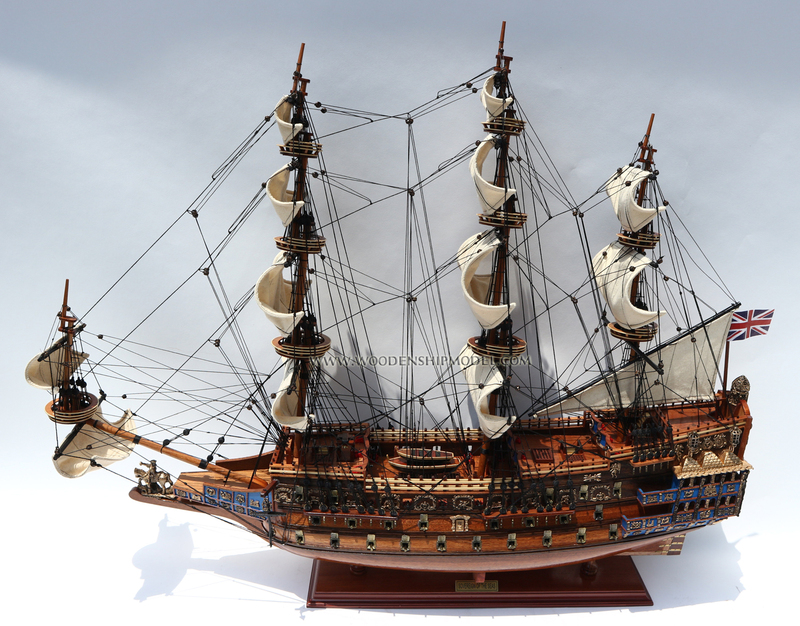 By 1660 her armament had been changed to 100 guns. 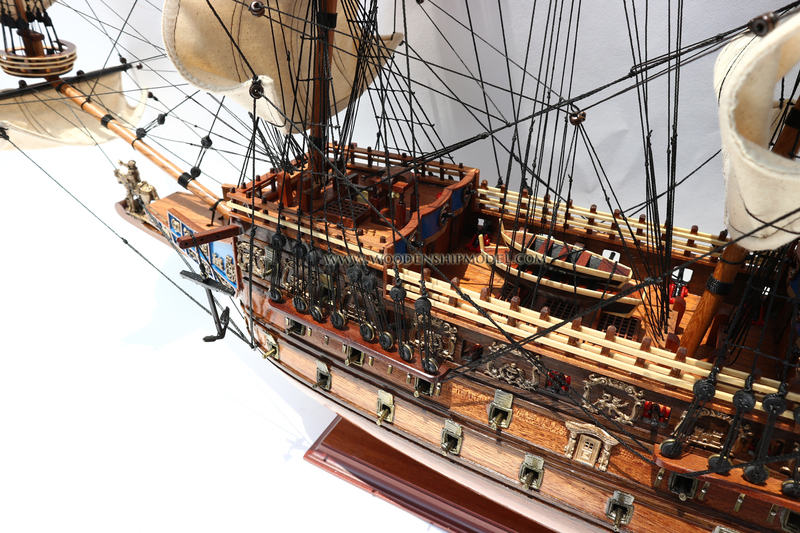 After the English Restoration she was rebuilt at Chatham in 1660 as a first-rate ship of the line of 100 guns, with flatter gundecks and renamed Royal Sovereign; most of the carvings had been removed. She was smaller than Naseby (later renamed Royal Charles), but she was in regular service during the three Anglo-Dutch Wars, surviving the Raid on the Medway in 1667 by being at Portsmouth at the time. She underwent a second rebuild in 1685 at Chatham Dockyard, relaunching as a first rate of 100 guns, before taking part in the outset of the War of the Grand Alliance against Louis XIV of France. For the first time she ventured into the Irish Sea, and later participated in the Battle of Beachy Head (1690) and the Battle of La Hougue, when she was more than fifty years old. In that period she was the first ship in history that flew royals above her topgallant sails and a topgallant sail on the jigger-mast. Sovereign became leaky and defective with age during the reign of William III, and was laid up at Chatham, ignominiously ending her days, on 27 January 1697, by being burnt to the water line as a result of having been set on fire either by accident, negligence or design. Some part of the popular folklore attributes the fire to an overturned candle. In her honour, naval tradition has kept the name of this ship afloat, and several subsequent ships have been named HMS Royal Sovereign. A painting from this ship survives on the ceiling of Commissioners House Chatham Dockyard, over the grand staircase. It depicts an assembly of the gods and depicts Mars being crowned by Neptune, surrounded by the goddesses - Hope, Peace, Justice and Plenty. The painting is surrounded by a gilded frieze depicting sea creatures. It is attributed to James Thornhill - Sargeant Painter. He painted the ceilings of the Royal Hospital Greenwich and the Dome of Saint Paul's Cathedral. 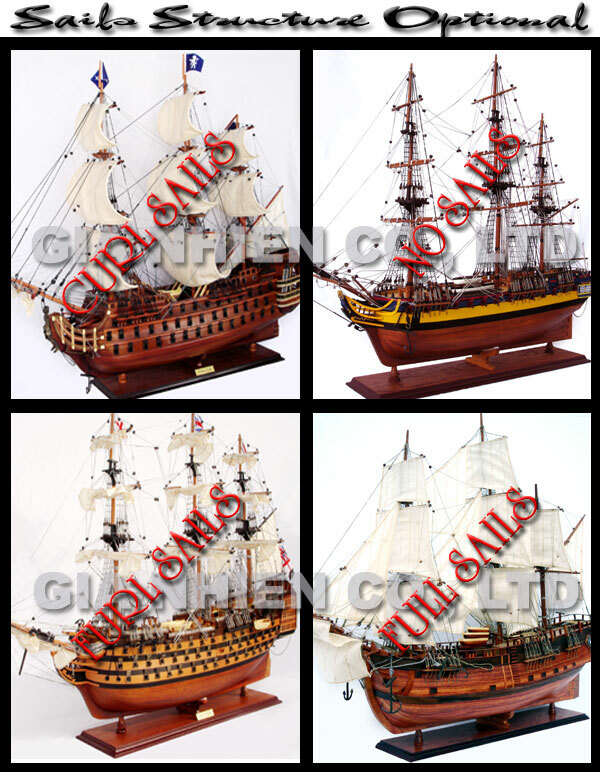 Each model is packed fully assembled in wooden crate and put in the carton.